Decatur, Alabama: Industry and the environment can coexist. That’s the claim of Alliance Source Testing. In fact, they have made it their mission to help industry succeed by specializing in the air analysis of industrial emissions. As a result, customers across the country have taken notice. Currently, Alliance Source Testing provides coast-to-coast testing and compliance services from five regional offices. The company partners with customers who range across a broad industrial spectrum, from power generation to chemical plants, from natural gas compression to aluminum recycling. In 2014, Alliance Source Testing completed air testing projects in 32 states. 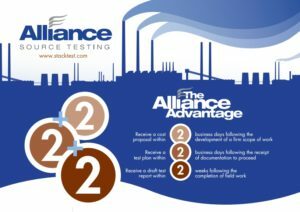 One of the factors separating Alliance Source Testing from other testing firms is The Alliance Advantage, simply stated: 2+2+2=The Alliance Advantage. This is Alliance’s guarantee that their customers will receive a cost proposal within TWO business days following receipt of a firm scope of work to be performed; a test plan within TWO business days following acceptance of the proposal; and a draft test report within TWO weeks following the completion of field work. With a laser focus on being the best emissions testing company in the industry, Alliance Source Testing continues to grow and is currently expanding at a rate of 30 percent per year. This growth ensures job opportunities for dedicated team members. The travel and long hours make our work challenging, but for those individuals willing to accept the challenge, the sky is the limit. The company has already implemented a 15 percent profit-sharing program and continues to search for qualified team members who are looking to make an impact on the environment, as well as improve industrial efficiencies throughout the United States.